From the sounds of the newest CD by THE STEELDRIVERS, it’s obvious that lightning really can strike the same place twice. 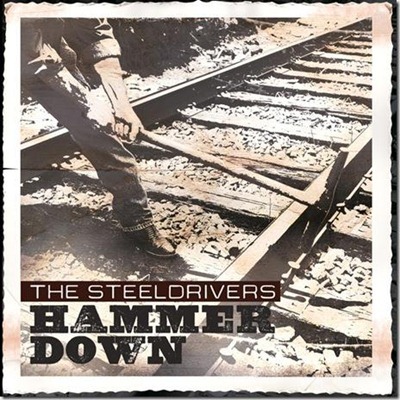 This release, “HAMMER DOWN,” is the first to include new singer/songwriter Gary Nichols and new mandolin man Brent Truitt. Fiddler Tammy Rogers, bass player Mike Fleming and banjo ace Richard Bailey must have had the gods of musical fate looking over their shoulders, because the replacements they found for Chris Stapleton and Mike Henderson don’t miss a lick, sliding right into place and keeping the band’s momentum motorin’ right along. This recording is every bit as distinct, different and edgy as their previous CD’s, maybe even more so…… there are songs you’ll hear on this one that are a direct result of the three remaining members charging full steam ahead, flexing their musical muscles and lighting a fire under the project. Having long time Producer/engineer Luke Wooten’s technical stability and talent in the mix also helped to keep that STEELDRIVERS “machismo” intact.